The race for a top four finish continues to sway as Chelsea take third at the expense of West Ham United. 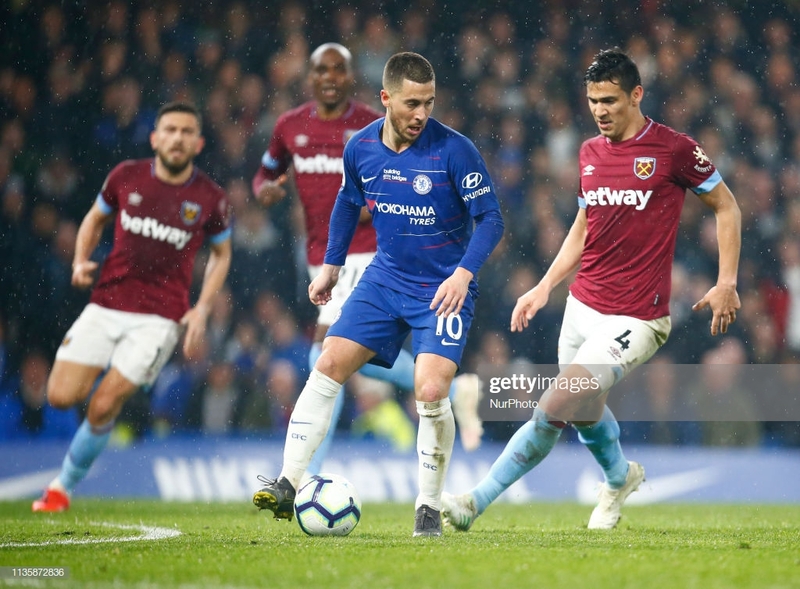 Eden Hazard’s brilliance was enough to give Chelsea the edge over West Ham United and leapfrog the Blues into third place in the Premier League. Chelsea’s dismissal in the race for a top four finish has been proved extremely premature. Solid, may be the most appropriate word to describe Chelsea’s 2-0 victory against their London rivals. Defensively, the team is undoubtably improving; Monday’s win was their sixth clean sheet in the last 10 matches in all competitions. This was an easy one. Two goals, a man of the match performance and a win at a crucial point in the season driven almost entirely by the Chelsea winger showed supporters that their number 10 will take some replacing should they be without his great services next season. With the transfer ban currently looming over Chelsea’s head, his replacement is nearer impossible than improbable, but you cannot help but feel that this would be the same even if the ban were to be lifted. Against West Ham he we immense. His first goal epitomised what he can bring to the side. Chelsea were playing well enough but could not find a way of breaking the deep back-line of the Hammers. Enter Hazard whose skill broke that same back-line entirely. Chelsea will inevitably find themselves in positions like that next season and without pure quality, exemplified by Hazard’s solo wonder goal, they may become stuck and drop crucial points. Callum Hudson-Odoi waited a long time for his first start in the Premier League. Now, in the matter of weeks, he has two. This has thrilled supporters who have been desperate to see his name on the team all season. Maurizio Sarri determined that it was simply a matter of slowly introducing a young talented player into the first team. He felt a sense of responsibility to ease the youngster into the Premier League to take pressure off of the English winger. Now, though, it seems, Hudson-Odoi is becoming more favourable. If Hazard does leave, his starts will sorely rise. He played well and posed constant threats from crosses to Gonzalo Higuain and Olivier Giroud. His versatility was highlighted when Hazard and Hudson-Odoi constantly switched wings. This troubled Aaron Cresswell and Ryan Fredericks. Chelsea’s loan signing Gonzalo Higuain has not hit the ground running like many thought he would. However, it must be said that Higuain has scored goals wherever he has been playing. He scored over 100 goals for Real Madrid, managed 71 goals in 104 games for Napoli and 40 in 73 for Juventus. It, though, hasn’t quite happened at Chelsea with only three goals since joining the Blues. He started against West Ham and looked menacing but failed to really make his mark on the game. His lack of movement meant that Angelo Ogbonna could mark the Argentine with relative ease. Enter Giroud who, it must be expressed, has an equally disappointing record in front of goal in the Premier League; he has managed to net just two in 24 appearances. Most of those appearances, in fairness, have come as used substitute. In contrast to the maximum degree, in the Europa League Giroud averages a goal every 74 minutes and is the competitions top scorer with nine. To emulate the same successes in the top flight, Giroud must be given more game time. He impressed after coming on against West Ham. His hold-up play was far superior and posed a more physical threat to the Hammers’ defence.